After suffering ‘intense mental agony’, Hamiora Pere was hanged at the Terrace Gaol, Wellington, and buried in an unmarked grave. He is the only New Zealander to have been executed after being convicted of treason. Hamiora Pere had been tried for treason in the Supreme Court in Wellington on 28 September. He was one of the first men charged under the Disturbed Districts Act, a temporary measure containing special provisions (such as smaller juries) for trying Māori who were deemed to be ‘in open rebellion’ and had committed ‘outrages and atrocities’. These trials were a legal landmark: the colonial government was asserting its ‘absolute sovereignty’ over all Māori. The attorney-general told the court that Pere had joined Te Kooti’s force at Puketapu, on the eastern fringe of the Urewera Range, in August 1868. He had taken part in the bloody raids on Matawhero and Oweta in November, and in the subsequent battles at Mākaretū and Ngātapa. There was no direct evidence that he had killed anybody and a murder charge against him was withdrawn. The jury took less than 15 minutes to find him guilty of treason, for which the death penalty was mandatory but could be commuted. 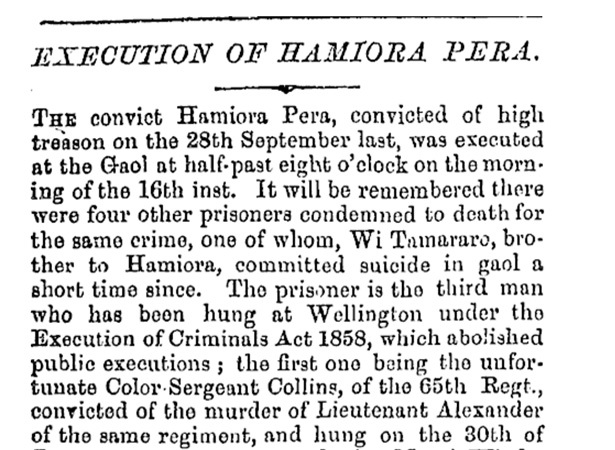 Hamiora Pere was one of five Māori men captured after the siege of Ngātapa (many more had been summarily executed) to be convicted of murder and/or treason. The government seems to have decided to execute one of them, ‘by way of example and caution’ to any Māori who were still tempted to take up arms. There was compelling evidence against Wi Tamararo, who was convicted of murder on 27 September but avoided execution by hanging himself two days later. There were extenuating circumstances for the other three, who had been convicted of treason. That left Pere. The fate of Hamiora Pere cast a long shadow. It was fictionalised in two novels published in 1986. Part of the back-story in Witi Ihimaera’s The matriarch, the trial and execution is the climax of Maurice Shadbolt’s Season of the Jew, in which a youthful Pere appears repeatedly as an informant of the central character, a colonial officer. In its 2004 report on the Turanganui a Kiwa claims, the Waitangi Tribunal recommended that the attorney-general ‘reassess the record … with a view to considering whether the decision to hang Pere was safe’. We have 3 biographies, 5 articles, related to Hamiora Pere executed for treason.